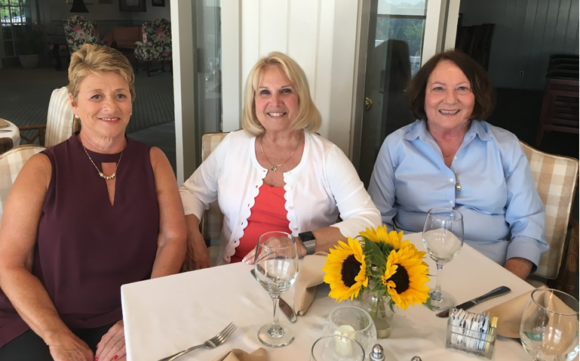 The organizers of the the 12th annual Terri Brodeur Breast Cancer Foundation golf tournament (from left to right) Ronnie Levine, Cathy Burnett and Charlene Amacher are pictured her during the post-event luncheon. For the three members of the Old Lyme Country Club who organized the 12th annual Terri Brodeur Breast Cancer Foundation (TBBCF) golf tournament July 19, it’s personal. Charlene Amacher, Ronnie Levine and Cathy Burnett have mothers, daughters and friends, who have faced a cancer diagnosis. It is the reason they organized and promoted the annual golf tournament, solicited donations from businesses and prodded their friends into signing up. It is the reason they pledge all of their donations to TBBCF, where 100 percent of gross fundraising dollars goes directly to research. And it’s why they opened up the tournament and invited the male members of the club to participate. “Everyone has been touched,” said Burnett. This year, the women raised $6,000 for TBBCF. More than 40 golfers, twice as many as last year, participated in the scramble and about 60 attended the following luncheon, which also featured a raffle and silent auction. Both Amacher and Levine’s mothers had breast cancer. Amacher’s mother was diagnosed when she was in her 70s and died at age 98. Levine’s mother was diagnosed in her 50s and lived until she was 92. Levine also tested positive for the CHEK2 gene mutation, which is linked to a variety of cancers. Burnett’s daughter was diagnosed with breast cancer in 2004 at the age of 37. Now, 14 years later, her daughter is cancer-free and a wife, a mother and a friend. But it is her friend’s story without a happy ending, that still brings Burnett to tears and keeps her motivated to raise money for research. Burnett and her friend, both nurses, were neighbors in Rhode Island with seven children between them. They carted each other’s kids around to movies, the PTA and swim club. While her friend was battling uterine cancer in 1999, she asked Burnett to play golf with her. Burnett said she was an excellent tennis player but had never before played golf. She took a few lessons. When her friend called one day to tell her she wasn’t strong enough to play any longer, she confessed that for months, the only time she got out of bed was to play golf. Her friend died in 2000, and Burnett tossed golf balls into her grave and figured she would never play again. But life had other plans for Burnett. After her husband of 40 years died from an occipital lobe glioma, a type of brain tumor, Burnett remarried in 2014 and the newlyweds moved to Old Lyme where she joined the country club. She also learned about the annual fundraiser for TBBCF. Burnett stayed in touch with her friend’s four daughters, attending their weddings, bat mitzvahs and talking to them about their risk of getting breast cancer. Three of the four daughters tested positive for the BRCA gene mutation, and one was diagnosed with breast cancer while in the hospital after just delivering her first child. After having children, the three with the mutated gene opted for bilateral mastectomies, hysterectomies and oophorectomies. Today, all are healthy and they have 11 children between them, Burnett said. Early detection and arming yourself with information is the key, Burnett said. TBBCF honors Terri Brodeur, a young mother of three, who died from breast cancer in 2005. The non-profit was established in 2006 by two friends, Norma Logan and Sandy Maniscalco, who wanted to raise money to go directly for cancer research. Norma died of breast cancer shortly after Terri. Each year the organization awards three $100,000 research grants from money it raises throughout the year.. 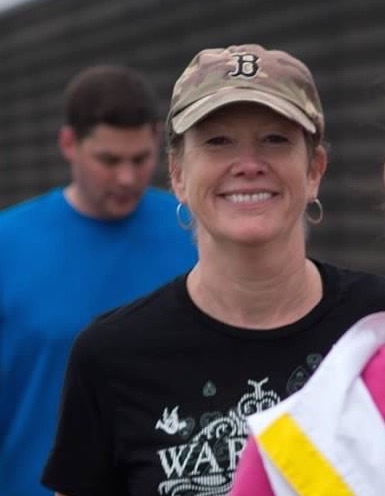 The signature fundraising event is the Walk Across Southeastern Connecticut marathon, which is being held Oct. 6, 2018. For information about the walk call (860) 437-1400 or visit tbbcf.org or email info@tbbcf.org.